The Westside Market East Village is a big store with 18,000 square feet and probably 75 employees. There’s a fair amount of turnover which often results a new person asking me what do I do. It’s not obvious since I don’t cover a station (unless you consider the beer aisle a station). The short answer, I co-manage the beer program—usually works, but in a way, a better answer is that I’m the in house advocate of connoisseurship. For instance we have a variety of hams, but the deli guys rarely recommend the small batch smoked ham on the bone over the Boar’s Head. The latter is easier to cut and it gets the customer on his or her way. I’m the person at least implicitly via my beer and cheese samples is here to encourage customers to explore what they don’t know. There is culinary gold in them thar hills. Sunday’s beer and cheese pairings began with Rosso di Langhe, a wonderful soft cheese from northern Italy. We carry a nifty selection of Taleggios, Robiola and the like, but they are off in the corner of the cheese case, so I feel like they risk getting overlooked. I put it on the board with Off Color Troublesome, a Gose from Chicago. It was hot and somewhat humid, so that seemed like a natural. Also I expected the light texture and fruity finish of the beer to go well with the texture of the cheese, and it did. The cheese disappeared quickly. So to finish the cheese I looked at the pile of cheeses my coworker was cutting for passive sampling and chose the Grafton Village 2 year old cheddar. I did it for convenience as I can prep a firm cheese faster and I’m always wary of letting the beer go flat. Still the creamy mouthfeel of the cheddar worked with the fizziness of the Gose. When I returned to the cheese station, I noticed that my coworker had a piece of the Marcel Petite Comte out for cleaning and trimming. I grabbed it, trimmed the mold off and put it on the board with Evil Twin Falco. It was the middle of Sunday afternoon and the pace of the shopping was relaxed enough that I knew I’d be able to tell customers the backstories of both the cheese and the beer. In addition the gentle nuttiness and delicately fruity flavor of the cheese balanced the hop character of the Falco, which is an IPA made with Falconers Hops. Ordinarily, I’d take a quick break to check on my fantasy baseball team or somesuch, but the late afternoon rush had begun early and everyone on the floor was scrambling, so I went to the beer aisle to choose another. Ordinarily, this is the time I’d break out a bomber, but you know what, our big bottle shelf had been decimated. It’s one thing to sell out of big bottles of white IPAs or Saisons during the summer, but we were even low or out of bombers of 11% ABV Imperial Stouts. Yes, it’s a great beer program, but a lot of that is because we have a great clientele. I had sampled an IPA and a Gose, so I made a saison, the Stillwater Cellar Door, next to the board. I was curious to see another cheddar, the Prarie Breeze would fare with it. The balance of the cheese highlighted the floral elements of the saison, which is brewed with white sage. The cheese finished before the beer so the final round of Cellar Door, I paired it with Red Leicester. We have one from Neal’s Yard and I’m on a mission to keep my coworker from trimming the mold on it. On a cheese like this, mold makes it better, more earthy. When I worked at Bedford Cheese Shop, we often had two or three Neal’s Yard cheddars on display and customers would often ask for the moldiest. The clientele dug the cheese and the backstory on its color. It worked well with the sweetness of the Cellar Door. I still had some Leicester left when the Cellar Door finished so I paired that with Arcana, a Belgian stout produced by Stillwater in tandem with Hof Ten Dormaal. The rich coffee notes of the stout paired wonderfully with lean, earthy sharpness of the cheese. Of coourse, the cheese finished halfway through the beer so since I was on a earthy kick, I put some Tomme De Savoie on the board and let the buttery earthniness work with the dark sweetness of the stout. There was just enough time for one more beer, so I took the easy route and chose the Hof Ten Dormaal Blond. The HTD’s are great beers but at $6.99 for a 12/7 ounce bottle they are pricey for my crowd. The blond has a sugarcane sweetness and a big yeasty mouthfeel that screams BELGIUM in the very best way possible. 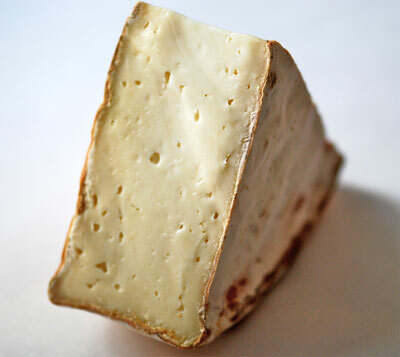 I paired it with Conundrum, a cider washed cheese from Jasper Hill Farms in Vermont. The cheese has a slight funk to it which was balanced by sweetness of the beer. It occurred to me later that a board of Conundrum and Troublesome would set off giggles through the store. Maybe Friday.